I posted a while ago about forgiving my ex husband for some of the things that he did during our marriage – one particular incident, which was brought back to me by a location on our recent holiday, I thought I would never ever forgive him for – but I found that nine years later, indeed I had forgiven, and was at peace with what had happened. In general I don’t carry grudges, I believe that anger with past events ultimately only hurts yourself and I’m lucky that I am able to process and let go pretty much everything ‘bad’ that has been done to me. The person I find hardest to forgive is myself. I would go as far as to say that I can’t forgive myself at the moment. I hold myself to the highest standards and (perhaps because I know what my inner feelings were at the time I made decisions that I subsequently see as wrong or stupid) I so often find myself blaming myself for things that have ‘gone wrong’. I am aware this is unhelpful.I know that if I were my ‘friend’ I would regard myself as entirely forgivable – I haven’t done anything really awful. In fact I would (externally observing) say that the balance of good things I have done v bad things is firmly tipped on the ‘good’ side. But still. I blame myself. In the wee small hours I turn over foolish things I have done, drunk and sober. I blame myself for decisions I made, knowing my motivations were sometimes selfish or ill advised. I think my therapist knows this, and I think a big part of what she is trying to help me with right now is understanding / believing that I am forgivable, that I am (at least potentially) lovable and not bad or to ‘blame’ for every thing that has happened to me. Now I see why its important to have a connection / like your therapist – because validation from someone you don’t like or don’t connect to doesn’t have much power does it! I also wonder about one of the other building blocks of therapy – the (and forgive my rather inexact language here) – the ‘reenacting’ of some relationships that have not been healthy – and wonder if Angela is being the ‘mother’ to my ‘child’ at this stage (early) in our therapeutic relationship. In reality I have a good ‘gut’ instinct and if I actually followed it, rather than my impulsive, romantic, optimistic heart, then I would not have gone so far wrong. (at least in my personal relationships) There are (must be) some powerful drivers that make me WANT to have a happy relationship – sometimes I think it must be any relationship with a man. Consciously, I SAY I’m happy alone – and honestly I FEEL happier now – yet my past behaviour shows clearly that when I meet someone I overlook obvious flaws in the relationship, or the individual, in pursuit of that elusive ‘happy partnership’. Of course those inherent flaws don’t go away …. And where is my drinking in all of this ? I’m dry now for 230 consecutive days, and honestly I love it. I don’t WANT to drink. Apart from a very few occasions, less than once a week, I feel no urge at all to drink. When I started this blog, that was a goal, but a seemingly unobtainable one. Now. I actually do not want to drink. I know it would set me back, and my clarity of thought is far too precious to risk. I’m not complacent about this, I know how fast it can turn, but for now, its all good, and feels secure. Of course its not a straight line as depicted here, and I fall between nostalgia, rage, turmoil, loss, hope, excitement and 100 other emotions – but I don’t doubt my decision to end the relationship was the correct one. It was the ONLY possible choice I had. God has forgiven you. And if God has forgiven you, you can absolutely forgive yourself. You are not superior to Him or His judgement. Forgive yourself. You are only human as we all are. We make mistakes and learn from them. And that makes us ultimately better people. As is God’s will. 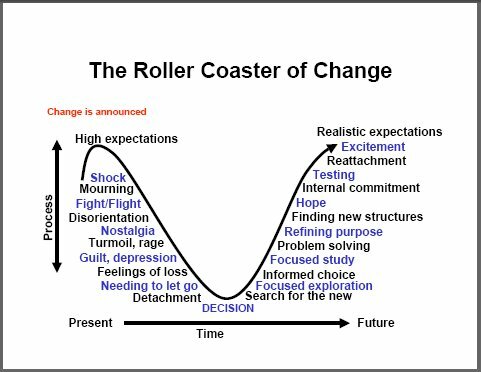 The Roller Coaster of Change sure beats the Merry Go’Round we can get stuck in. Loved this chart. I printed it out to keep as a reference for some things in my life. Thanks for sharing.